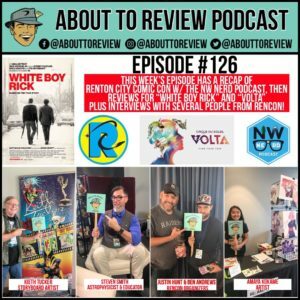 Another action packed comic con weekend, this time in Tukwilla, Washington at the 3rd annual “Renton City Comic Con” (RCCC)! 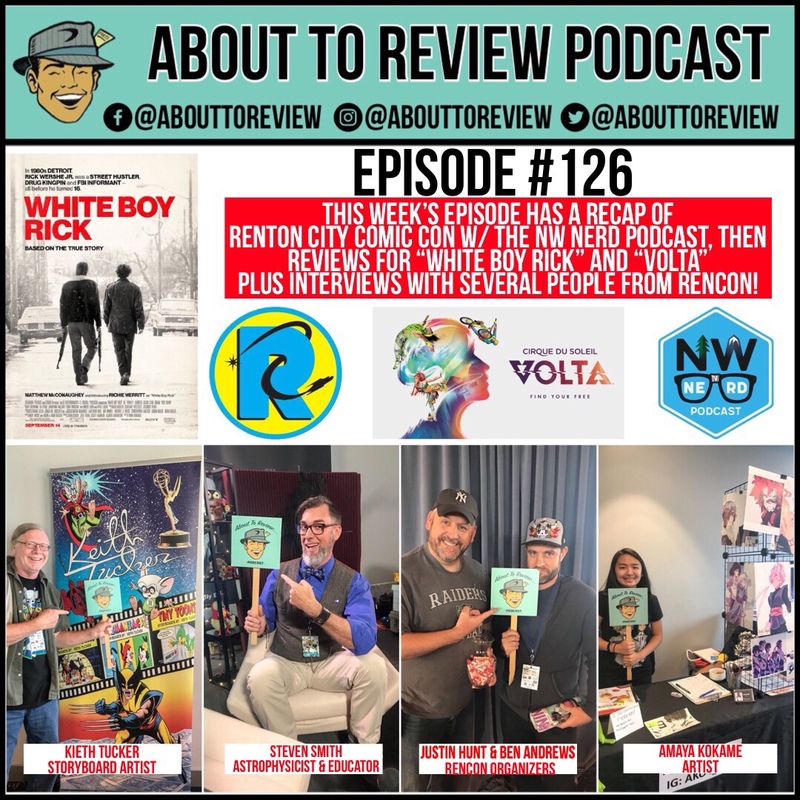 A full recap of the event plus interviews, and finally reviews for “White Boy Rick” and “Volta” by Cirque Do Soleil! First thing: Thank you so much for nominating and voting for me in the Renton City Comic Con: Geek Awards. I am proud to say that I won “Geek of the Year”! Two comic cons in two weekends! Last week it was “Rose City Comic Con” in Portland, OR, and this week it was “Renton City Comic Con” (RenCon) in Tukwilla, WA! RenCon was a blast all weekend from the VIP parties on Friday and Saturday, to sitting down and interviewing people on Sunday, I had a great time! On this episode you will get to hear a con recap with me and the NW Nerd Podcast crew of Nick and Dyer talk about our favorite things we saw over the past weekend. After the recap there are 4 interviews, which I will also be cutting up and putting into a video that will be on the “About To Review” YouTube channel this Friday. Those interviews include Amaya Kokame, Keith Tucker, Steven Smith, Ben Andrews, and Justin Hunt. After those sections I come back to the studio and give my reviews for the new biopic “White Boy Rick” and finally the new Cirque Du Soleil show “Volta”. Thank you so much to all of my guest for making time to be on this episode. Make sure to follow them on their social media channels below!